NASA’s New Horizons spacecraft, now on its way to its second target, may have detected evidence of a wall of hydrogen that scientists theorize exists at the boundary between the heliosphere, a bubble-like region influenced by the solar wind, and interstellar space. 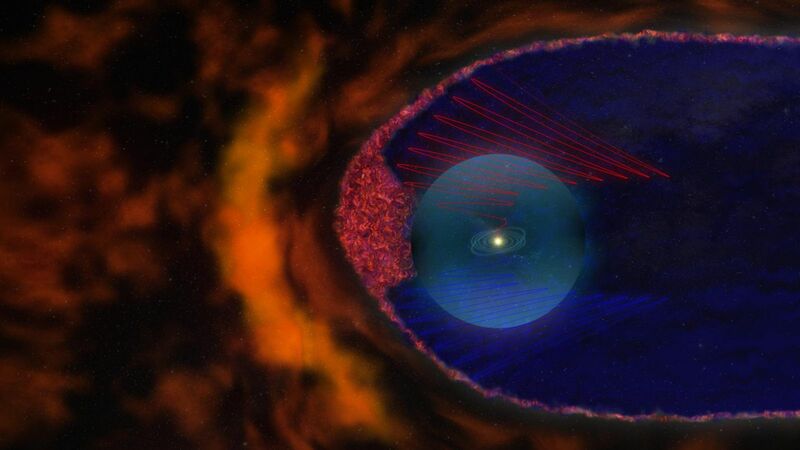 The heliosphere extends from the Sun outward to far beyond Pluto, with the entire region maintained by the solar wind against pressure from hydrogen and helium gases within the Milky Way. Composed of charged particles that stream outward from the Sun, the solar wind inflates a “bubble” around the solar system and beyond, up to a distance of approximately 100 AU (astronomical units, with one AU equal to the average Earth-Sun distance or 93 million miles). There, uncharged hydrogen atoms from interstellar space collide with the solar wind, and, according to some scientists, build up a wall of hydrogen that uniquely scatters ultraviolet light. Thirty years ago, NASA’s Voyager 1 and Voyager 2 spacecraft observed a scattering of light that some scientists see as evidence of the hydrogen wall’s presence. New Horizons, which used its ultraviolet telescope to search the sky for this hydrogen wall, observed an ultraviolet glow at the solar system’s edge that could be proof of the wall’s existence even before it flew by Pluto in July 2015. “We’re seeing the threshold between being in the solar neighborhood and being in the galaxy,” noted New Horizons mission team member Leslie Young of the Southwest Research Institute (SwRI) in Boulder, Colorado. Between 2007 and 2017, New Horizons scanned the sky in ultraviolet wavelengths seven times, reported Randy Gladstone of the Southwest Research Institute (SwRI) in San Antonio, Texas. During this time, the probe observed changes in the ultraviolet light consistent with those seen by the Voyagers approximately 30 years ago. Mission scientists acknowledge the distant ultraviolet light the spacecraft saw could be from a more distant source in the galaxy rather than from the theorized hydrogen wall. “It’s really exciting if these data are able to distinguish the hydrogen wall,” said David McComas of Princeton University, who did not take part in this study but pointed out that confirmation of the wall’s existence would help scientists better understand and constrain the boundary and overall shape of the solar system. After its New Year’s Day 2019 flyby of Ultima Thule, its second target, New Horizons will search for evidence of the hydrogen wall approximately twice each year until the mission ends sometime between 10 and 15 years from now, when the spacecraft runs out of fuel. Before that happens, mission scientists are considering a flyby of a third target after Ultima Thule. If the ultraviolet light does not fade during these observations, it likely is coming from further in the galaxy rather than from a hydrogen wall at the heliosphere. A paper on New Horizons‘ detection of the ultraviolet glow has been published in the journal Geophysical Research Letters.